At this stage Hope Heals has been focusing only on the most vulnerable adults, otherwise the children in the community need the support mostly as the schools have been closed for holidays and they are at home from morning till sunset. They have therefore come up with a strategy to serve one solid meal a day that they are handing out around 12pm which can sustain them until the next day’s serving. We are aware that this sole meal per day is not sufficient for the children’s nutrition requirements but it’s all we can do at this stage in order to serve at least a nutritious meal a day to save them from starvation. This solid meal includes stiff maize porridge with beans and carrots, and other times accompanied by soya mince stew, cabbage and also peanut butter, another source of high protein. They have been able to feed around 110 children at one of the local schools which is located close to Hope Heals Centre, and as it has a clean hall with tables is much easier than serving the meal on the floor to so many children. "Hello my Brother Mwana and all at Plenty Canada! Thank you ever so much for all the regular reports you write and send to Canada thus making the Soup Kitchen a success while saving all the lives of the beneficiaries including myself. We have been blessed by Plenty Canada's continuing financing thus supporting Hope Heals’ hard work in the field assisting a few of our underprivileged people around our Centre, and for that we are deeply grateful. We truly appreciate all your efforts as I know you are having sleepless nights there trying to take every opportunity to continue to support us and willing hearts which are transformed to strong energy and willingness, we wouldn't be able to reach these people without you. God Bless you abundantly and the people also pray for you and wish you a Merry Christmas and New Year. For me, every minute I get, I thank the One above all for you and to continue bringing you all the luck and wisdom!" Hope Heals is a grassroots community organization, founded by Sylvia Khuzwayo, that advocates for people living with HIV/AIDS in the communities of Lavumisa and Hlangano, Swaziland. One of the goals of Hope Heals is to enable people living with HIV/AIDS to get anti-retroviral medications (ARVs) closer to their homes and communities. Many people are stopping treatment because the health facilities are far away and they cannot afford the public transportation costs. Hope Heals has done a lot of work going door to door in the communities that are very poor and affected by HIV and tuberculosis. Some patients have to be carried by donkeys for a distance of approximately 15 kilometers before they reach the main road where they can take the bus to a health centre. Most children on ARVs are orphans and stay with their grandparents or distant relatives where they share their small homes – sometimes with over ten family members sleeping in the same room. Hope Heals assists their family members with the administration of the correct ARV doses to the children and to see that they are given at the correct time. 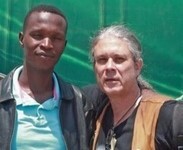 Hope Heals offers hope to these people that life goes on even with HIV. Some families do not have food at all, which makes it difficult for them to take the ARVs, so we mobilize friends to donate used clothes and food and then distribute it to the neediest families who sometimes go for days with nothing to eat. 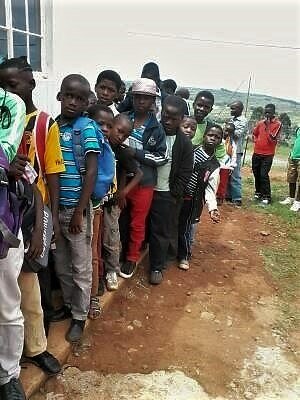 Primary education is now free in Swaziland, but these children still do not go to school because they cannot afford uniforms and shoes. Hope Heals is continuing with the home visits, and trying to gather used clothes and food for the very needy communities. Growing crops in some of these communities is not possible as there is no water availability and it seldom rains. It is the driest part of Swaziland and most poverty stricken area. Hope Heals acquired land in 2015 to start its community center. Members have fenced the entire area. A building has been erected to be used as office and community center, as well as a soup kitchen where the children can eat, take their treatment under direct supervision and then attend school. The Soup Kitchen also started a vegetable garden in order to grow vegetables for the members and sell the surplus to cover extra expenses, and have begun raising chickens. Mwana Bermudes is seen here on the right. The Soup Kitchen project is coordinated by Mwana Bermudes of Kanimambo Creations and financed by Plenty Canada. This program aims at feeding daily approximately fifty members of Hope Heals, a nutritious and high protein vegetable soup. This humble but crucial relief food program will hopefully help them to survive until the rain season finally comes around October or November. Sylvia Khuzwayo is the founder of Hope Heals. She is herself a brave HIV positive lady. With her enthusiasm and active life to help others she has become a living inspiration and living example for many to survive the pandemic with a positive attitude. It has been an overwhelming but also a true meaningful experience to say the least, carrying out the Soup Kitchen program on the ground with the realities of working in the rural areas of Africa. Without personal transport and with a limited budget it is a real challenge. Nevertheless, Sylvia has bravely managed to feed regularly between 20 and 30 people since July and that has been a great achievement. Today I had to travel to one of the worst areas around the Hope Heals Centre that have been affected by the HIV pandemic where some people are suffering from multi-drug-resistant Tuberculosis and of course from starvation caused by the severe drought. I started by visiting two men friends who are both paralyzed and permanently deaf because of the side effects of their heavy medical treatment. They were so grateful that I brought them some cooked food to eat as they were so hungry. One of them wept because he never thought God was touching people somewhere to provide for people like himself. Then at another place I struggled quite a bit while helping children to fetch water using starving donkeys which are so weak to carry it and travel long distances for the whole day. Poor animals and there is no grass for them to feed on, it's just a question of time before they drop dead like many others. I also visited a family who has gone for days without anything to feed their innocent children who do not understand the plight that is faced by their desperate parents. Bread, soup and juice was served to them and all who also managed to come. Most of all these people hope that one day things will be fine, what a spirit of courage they manage to keep! One of the mothers was also crying because she did not believe her fortune of receiving something to eat and share it with her children. It was heartbreaking as you can imagine, it turned into a very emotionally draining day for me, seeing people who have had a good normal life at some point and are now not able to walk and cannot hear because of the effects of their sickness. And again the never ending drought which is hitting them even harder as they cannot provide for themselves and their families from their dried out gardens and with no close by water sources for irrigation. Yet there is not much water available in most of the communities, and all cattle in the area have already perished with only donkeys surviving so far but certainly getting weaker by the day. The plastic reusable tumblers I have originally bought to serve the soup and juice are not useable anymore due to infection control purposes. The people here are really not well and most have mouth ulcers which can cause more harm than good if we re-use the plastic containers and share among the people, as they are not properly washed and disinfected. Therefore we have decided to use disposable plates and cups, and I tell each person to wash and keep it for the next serving. This way it is safer as they cannot infect each other anymore with mouth infections. Unfortunately nothing has changed on the situation of hunger and drought. There were small rain showers on Saturday (September 17) but these did not even cause the dry streams to run. The trees are still dying – even the hardiest types – and there is no grass at all. Note: We are pleased to be able to report that the rain did finally come in the following months. Tomorrow I am going to pay for water, not sure when they will deliver for us. Once the water is delivered I will let you know because even where we buy the water you find a list of people who paid first and you also have to wait for your turn in order for the water tanker truck to deliver. Then we will buy the pot and the tumblers for serving the soup. I am trying to put things together and it is the water that is delaying us, however we have begun serving soup to a few members. Otherwise things are moving and Hope Heals is already making a difference even under these difficult circumstances. These past few days I'm trying my best to sensitize the Hope Heals members about our soup kitchen project kicking off and how they all have to contribute in getting firewood and also helping in turns to prepare the soup. Also discussed how best we can make sure all the people whom we are targeting get the soup and bread. The members suggested that we will sometimes carry out a mobile soup kitchen so we also reach those people who have given up and don't want to be seen in gatherings because of their poverty situation, as some don't even have clothes and have decided to isolate themselves. 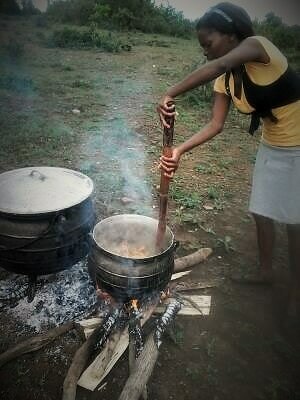 I visited some of those families and told them that we will come to them time and again and serve them soup and bread. I did this to make sure they understand our support. Sometimes people who have suffered so much prefer to die in silence. This particular family of 11 members share a one-room hut which is practically falling apart. The mother of the children is HIV positive and she is not doing well on ARVs because sometimes she does not take her medication. In fact lately she hasn't been going to the clinic to pick them up, reason being the distance from where she stays, as she will have to walk 38 kms on foot! This situation has led her to have an increased viral load as she defaults on treatment now and again. Another reason being that sometimes they stay up to four days without eating anything at all, and that causes her to vomit when she takes her ARVs on an empty stomach. The youngest of her children is one year old and she was born at home as the mother did not have the means to go to the hospital to have the baby delivered there. The baby was tested for HIV when 6 weeks old however she was HIV negative when she was born, but due to her mother breastfeeding the baby she is now HIV positive. For more information about the Hope Heals project, click here.